I shared yesterday a remarkable TV show about Estonia’s entrepreneurial miracle. Today, let’s look at the Chilean version in the series. 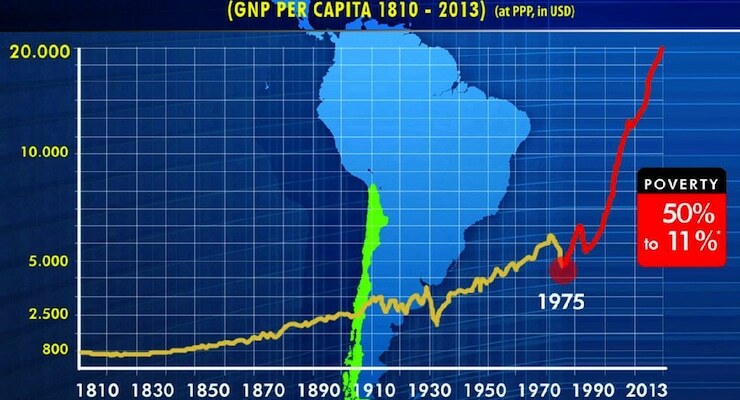 It shows how the South American nation, which now is ranked very high for economic freedom, is a shining example of how small government and free markets are a recipe for good results. I don’t follow Chile as closely as Estonia, so instead of five good and bad policy developments (or lack thereof) in the nation, we’ll focus on three favorable items and one unfortunate feature. First, Chile is the world champion for personal retirement accounts. It shifted from a failed pay-as-you-go tax-and-transfer to a funded system of personal accounts. Workers were given the opportunity to stay in the old system, but more than 95 percent realized it was better to have private savings rather than empty promised from politicians. 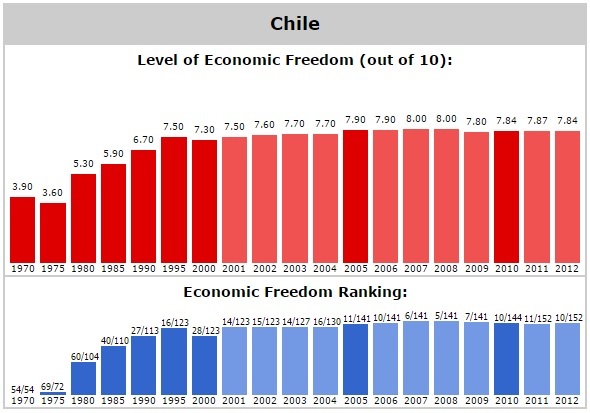 Second, Chile’s shift to free trade and away from protectionism has been enormously beneficial for the economy. Openness has produced big benefits for consumers, and also created big markets for exports. Third, Chile shows the value of monetary stability. If you look at the big increase in the country’s economic freedom since 1975 and break it down by the major sub-categories, there have been impressive improvements in fiscal policy, regulatory policy, trade policy, and rule of law/property rights. But the biggest jump was for monetary policy. The nation went from hyperinflation and instability to a more sensible monetary regime. Here’s the one thing that worry me about Chile. Chile has enjoyed reasonably stable and practical leaders since suffering the chaos and brutality of Marxist and military governments in the 1970s and 1980s. Even left-leaning governments have been reasonable, recognizing that it would be a mistake to undermine the goose that has been laying golden eggs. That’s the good news. The bad news is that some recent politicians have adopted strident anti-market views. And the nation’s economic freedom score and ranking have both marginally declined in recent years. By the way, you’ll have noticed in the above video that Peru also got some positive attention for its economic reform. It isn’t ranked nearly as high as Chile, but the progress has been enormous. Particularly when you consider how other nations in the region such as Venezuela are total basket cases of statism. P.S. Chile also has one of the world’s best school choice systems, though it also has come under pressure from recent left-leaning politicians. I was no fan of Pinochet’s but as a strongman(or The CIA putting him there) he did more for the people of Chile than any other elected or unelected ruler in South America did for theirs. For as much as the left praised Allende he was about to turn Chile into a Communist state based on who was really backing him. We all own Pinochet a debt for actually serving those who were under his rule.